If you are joining from Joanna Weaver's blog today, Welcome! ​I've so enjoyed sharing with you about using Joanna's free resources to plan a Having A Mary Heart retreat. Now I would love to show you some pictures of our event and how you can complete some of the project we created. 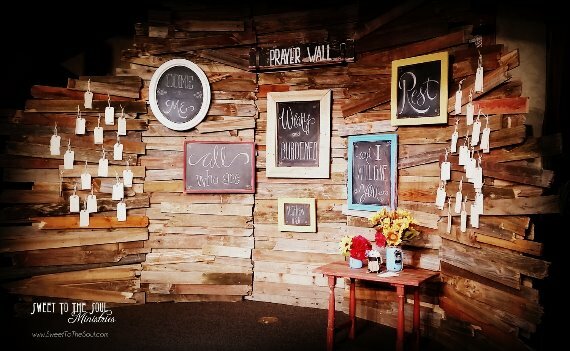 ​Stage backdrop "Prayer Wall" with the retreat memory scripture, Matthew 11:28, and tags for prayer requests. ​The wall was constructed by a church staff member using old pallets as the wall frame and randomly attaching and layering recycled wood fencing. Each chalkboard has a unique composition - be resourceful with your recycling. 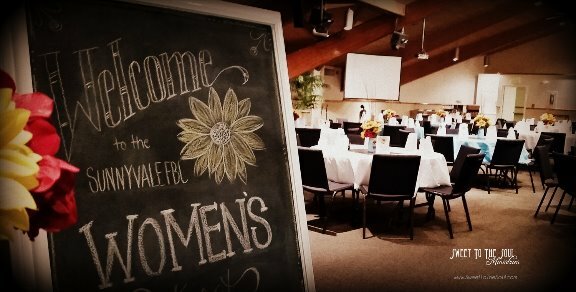 ​The Welcome sign was hand-lettered on a large [3'x4'] chalkboard wrapped in a frame made from household molding, and then displayed on a large art easel. Table centerpieces were beautiful sunflowers arranged in painted canning jars. ​Each jar was painted with ordinary craft paint, which naturally has a chalky finish, then hand sanded to give each jar the aged look. ​Also on each table was a recycled can, painted with chalkboard paint, to hold prayer tags which could be hung on the Prayer Wall. ​Each of these items sat on top of a small piece of burlap over a black poster board square which had the memory verse lettered around the edges. A great visual to help every memorize our scripture verse during the retreat. ​Don't be afraid to use inexpensive recycled materials. Be creative! An event is not complete without a little swag. 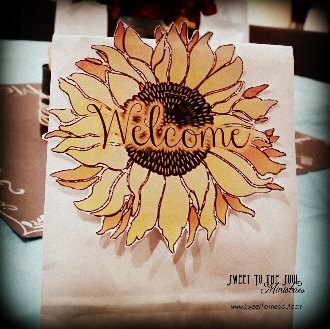 So we used plain white paper lunch bags and printed this bright sunflower "welcome" to attach and close the bag. ​Each was filled with a small pack of tissue, a note pad, a pen, and some treats including M&M's (Mary & Martha). A swag bag was waiting at each attendee's seat when they arrived. 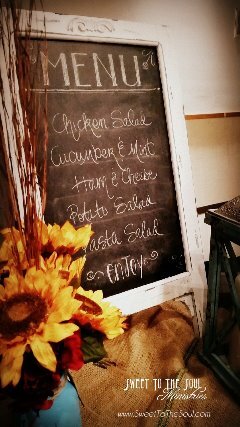 The lunch menu was hand lettered on a premade whitewashed chalkboard sidewalk sign. It displayed the menu on both sides. It was the perfect size to display on the buffet table and easy to modify for each meal's menu. 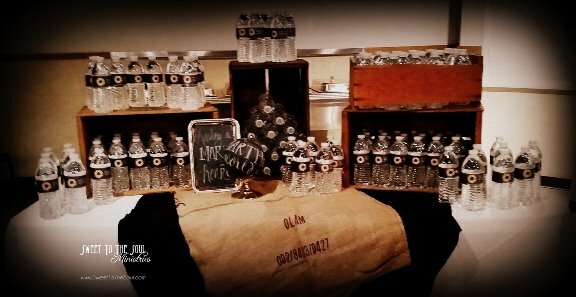 Even the Water Station was given a creative touch using old crates, a burlap coffee bean bag and individually custom labeled bottled waters. An easy and quick way to reinforce the them of your event. ​You can download these bottle wraps to use at your next event. Just print, trim and adhere to you water bottles. 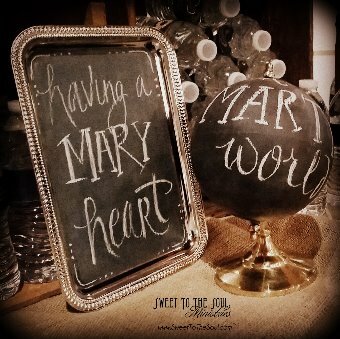 ​One of the most fun décor items was this "Having a Mary Heart in a Martha World" chalkboard tray and globe. 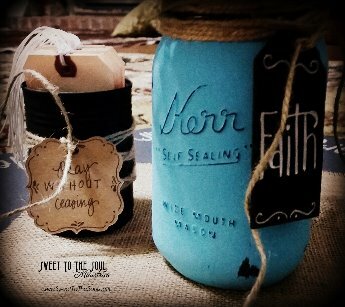 Both were thrift store finds which I painted with the chalkboard paint then hand lettered with our study's title. Chalkboard was everywhere! Even on the event staff. 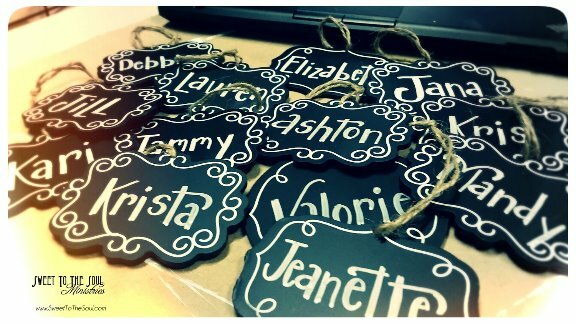 These were made from purchased mini chalkboards which I hand lettered each volunteer's name. A small jewelry pin was glued to the back. ​Thanks so much for dropping by today! 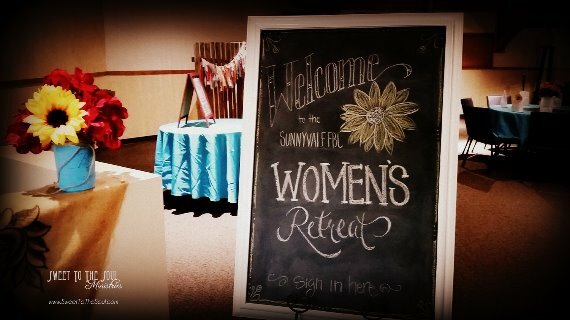 I hope that taking a peek at some of our event details will inspire you as you plan your own Having A Mary Heart Retreat. As you do, be sure an share your event on social media. Tag Joanna Weaver and use the hashtag #HavingAMaryHeart, you just never now how God will your creativity to inspire others. 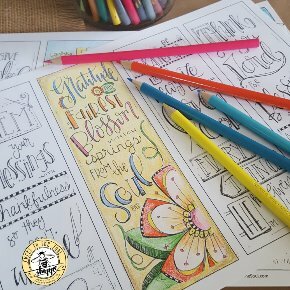 If you enjoy worshiping God through creativity, then I invite you to take a look at our Soul Inspired Bible Journaling Templates / Color Your Own Bookmarks in our Shoppe and let your soul be inspired! I love all of these ideas! Event decor and freebies speak my love language. I once planned events and my heart still beats a little faster when I see an event so well done. I always told my volunteers, "We want each one to feel like we planned for them to be here. Love is in the details." Beautiful, Jana!